The Wedding Photography Agreement is used for providing specific wedding photography and printing services to your customers. This contract covers engagement of services, deliverables, ownership rights, non-competition at the event, and more. This Wedding Photography Agreement is included in editable Word format that can be customized in Word or by using the included Wizard software. THIS AGREEMENT is made this Current Day day of Current Month, Current Year by and between Company Name ("Photographer") and Company Name ("Customer"). Photographer is in the business of providing custom wedding photography and printing services for a fee. Customer desires to have Photographer render specific services (the "Services" or "Wedding Photographer's Services") as set forth in Exhibit B. Services shall be rendered on specific dates (the "Event(s)") as set forth in Exhibit B (the "Specifications"). Provide to Customer a pre-wedding event consultation, by phone or in person prior to the Event to finalize specific shooting times (the "Times"), determine any custom shots (the "Shots"), or set forth any locations (the "Locations") that Photographer will be required to travel to in order to render the Services to Customer. Customer has the sole responsibility for arranging this pre-wedding event consultation with Photographer, and failure of the occurrence of a pre-wedding event consultation shall not constitute breach of this Agreement. Provide the agreed Wedding Photography Services on the dates, Times, and Locations as agreed upon in the Specifications, and provide images taken during the Event (the "Proofs") to Customer as soon as they are available. Provide proof of agreed-upon expenses associated with the Event and the execution of Wedding Photographer's Services, and present them to Customer for approval. Provide to Customer a post-wedding event consultation to review all images taken during the Event, or otherwise arrange for the insured delivery of any images or other related materials. Provide other such services as Customer may request from time to time, such as additional Shots, assistance to Customer's staff and employees, or additional project consulting. Photographer agrees to provide the Wedding Photography Services pursuant to the specifications set forth in Exhibit B attached hereto (the "Specifications"). Customer shall retain all of Customer's intellectual property rights in any logos, graphics, text, images, or other components owned and transmitted to Photographer for use in fulfillment or creation of Wedding Photography Services. Photographer shall retain, under the fullest extent under the law, full copyright and interest in any and all film, digital files, proofs, samples, prints, or negatives created or produced for Customer pursuant to this Agreement. Customer agrees to return to Photographer any materials Customer may have of Photographer's, such as artwork, mock-ups, comps, text, digital media, film, images, or any other physical or digital embodiment of Photographer's creative work performed under this Agreement. Upon termination or expiration of this Agreement, Customer agrees to be solely responsible for any additional use of materials created by Photographer pursuant to this Agreement. Additional expenses may include, but are not limited to: fees, licenses, translations, royalties, talent, and other associated fees. Photographer's obligation in 4.a shall not apply in any respect to foreign use. Customer is granted a non-exclusive worldwide right to use the materials for Customer's own promotional, advertising, internal use or any other agreed-upon use as outlined in Exhibit B. Photos or materials are NOT to be resold or distributed to any third parties or event participants. Photographer's copyright must accompany all use of the photos or materials whenever possible and must read "'Copyright Current Year, Photographer's Name or URL. For all of Photographer's Services under this Agreement, Customer shall compensate Photographer in cash, pursuant to the terms of Exhibit A attached hereto. In the event Customer fails to make any of the payments referenced in Exhibit A by the deadline set forth in Exhibit A, Photographer has the right, but is not obligated, to pursue any or all of the following remedies: (1) terminate the Agreement, (2) withhold all materials, Services, and content, or (3) bring legal action. All licenses shall be revoked if Customer fails to make any of the payments referenced in Exhibit A by the deadline set forth in Exhibit A. Limited Warranty and Limitation on Damages. Customer agrees to indemnify and hold Photographer harmless with respect to any claims, loss, lawsuit, liability, or judgment suffered by Customer that results from the use of any material prepared by Photographer or execution of Wedding Photography Service by Photographer or at the direction of Photographer, that has been materially changed from the Specifications. Photographer shall not be responsible for missing any Key Shots. Key Shots shall be defined as any requested photographs or images made to the photographer by Customer or any person(s), place(s) or things. Photographer shall not be responsible for any adverse effects or the impact of such upon deliverables resulting from, but not limited to: weather, timing, actions of individuals present at any shooting location or deliverables dependent upon the actions or presence of individuals at any shooting location, transportation issues, equipment failure, access to shooting locations, or anything else not under the control of the Photographer. Photographer shall not be responsible for any delay or loss of shooting time due to any action or inaction, or for any adverse effect that the Customer may experience that is the result of any action or inaction on the part of the Photographer. In the event of illness, injury, or other medical reason, or for unforeseen scheduling conflicts, Photographer may substitute another photographer to fulfill this contract. Photographer shall not be responsible for discoloration, faded colors, or any degradation of dyes, inks, or other printed media over time, nor is Photographer under any obligation to store or archive any film, proofs, or digital photos for later retrieval by Customer, unless specifically contracted to do so. Customer agrees that Photographer shall be the sole and exclusive Photographer for the event(s) and at no time shall any third party interfere or capitalize on the work being done by the Photographer, including, but not limited to: Engaging Family or the Wedding Party at the event(s) for the purpose of staging and taking photographs; attempts to shoot any photos of anyone at any time while Photographer is working; attempts to shoot photos of Photographer's "staging" and "posing" of shots; and any other activity deemed by the Photographer to be interfering with the Photographer's work or rights at any time. Customer warrants they have not signed any exclusive contracts with any other Photographer or Agency that would preclude or interfere with Photographer's right to render the services or otherwise conduct business at the event. A copy of official event credentials and/or any security passes required to move around event locations. A parking pass that is as close to the event location(s) as possible. Access to a secure storage area at the event location(s) for equipment and materials. Contact cell phone #s for event staff at event location(s) who are responsible for event planning, PR or production, or for any deliverable listed on Exhibit B. A list of all requested shots or key shots. An event timeline or schedule that contains a list of all start/end times for each key event or key shot. All event maps or driving directions to event location(s). This Agreement shall be binding upon and inure to the benefit of Customer and Customer's respective successors and assigns, provided that Customer may not assign any of Customer's obligations under this Agreement without prior written consent of Photographer. Customer shall have no right to assign any of Customer's rights nor have the right to sublicense photographs or materials to any other parties. Customer warrants that everything Customer gives Photographer to use in fulfillment of Wedding Photography Services is legally owned by or licensed to Customer. Customer agrees to indemnify and hold Photographer harmless from any and all claims brought by any third party relating to any aspect of the Services, creative or other content, including, but without limitation, any claims resulting from missed Shots, missed Times, inaccessibility to Locations, weather-related problems, inaccessibility or lack of cooperation from critical employees, staff, or other personnel required by Photographer in order to meet any of the deliverables or obligations listed in Exhibit B; difficulty in gaining any access to the agreed-upon Locations or any demands, liabilities, losses, costs, and claims, including attorney's fees, arising out of injury caused by Customer's products/services, material supplied by Customer, copyright infringement, and defective products sold via the advertising or Services. Further, Customer agrees to indemnify Photographer from responsibility for problems/disruptions caused by third party services and contractors that Customer may use, such as reproduction services, enlargements, digital processors, transportation, shipping or hosting services, film processing, and other services that relate to the execution of the Services outlined in this Agreement by Photographer. This agreement shall begin on Current Date and shall continue in full force until terminated by either party upon at least thirty (30) days prior written notice. The parties represent and warrant that, on the date first written above, they are authorized to enter into this Agreement in its entirety, and duly bind their respective principals by their signatures below. 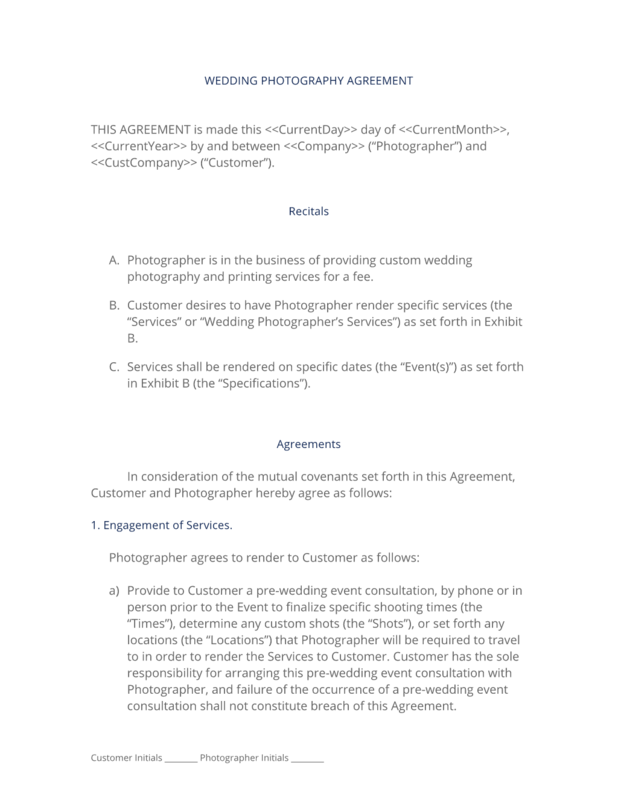 The complete Wedding Photography Agreement - with the actual formatting and layout - is available in this Contract Pack.